Doll Man, who debuted in the 27th issue (December, 1939) of Feature Comics. Feature was published by Quality Comics, where Plastic Man, Torchy, Phantom Lady and other well-known characters got their start. 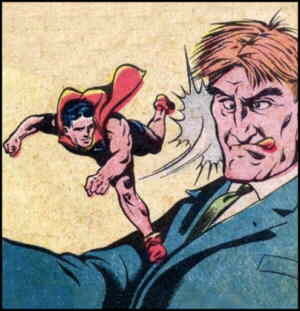 It had begun as a reprint outlet for a few McNaught Syndicate newspaper strips, such as Dixie Dugan, The Bungle Family and Joe Palooka, but Doll Man quickly eclipsed its other series — with his fourth appearance, he was featured on the cover; and he occupied that position in the majority of issues for nearly a decade. The character was created by Will Eisner, the prolific genius responsible for Blackhawk, Sheena and many others, but best known for The Spirit. (It was Eisner, by the way, who did Wonder Man, the first of the Superman knock-offs, at the behest of publisher Victor Fox.) Eisner wrote the early stories (under the pen name "William Erwin Maxwell"), and Lou Fine, who worked in Eisner's comics packaging shop, drew them — but the artist most associated with Doll Man is Reed Crandall, who drew the series from 1940-42. Crandall's work also appeared in such diverse venues as EC Comics and Treasure Chest (a comic book distributed through Catholic schools from 1946-72). Doll Man was research chemist Darrel Dane, who invented a formula that enabled him to shrink to six-inch height, as well as one to bring himself back to normal. Unlike a later and more famous shrinking superhero, The Atom, who could continue shrinking all the way to the sub-atomic realm, Doll Man had only one alternate size — or at least, that's how it was supposed to be. As actually drawn in his Doll Man form, tho, he appeared anywhere from six inches to a couple of feet tall, often varying in size within a single story. Whatever his size, his first use of his new-found ability was to save his fiancee, Martha Roberts, from a criminal attack. Afterward, he decided, in what was starting to become the tradition of characters of his nascent genre, to use his great powers in the service of good. Also in that tradition, he made himself a distinctive costume for the purpose (a legless, armless, blue gymnast's outfit for ease of movement, combined with a high-collar red cape to make movement difficult again, rounded out with bright red footwear that looked like a pair of elf booties), and kept his true identity hidden. Martha, however, was in on the secret, and later, using the same shrinking potion, became his sidekick, Doll Girl. He kept at it years longer than most of his contemporaries, possibly because he was able to do such visually interesting things as ride on the back of a housecat, hide inside a safe, or fly a toy airplane. His series in Feature Comics ran until #139 (October, 1949). He also had his own title, starting with a Fall, 1941 issue and (except for a hiatus from 1943-46) lasting until October, 1953. Later, he was the subject of an unauthorized revival by Super Comics, which published five issues of reprints in 1964. Quality Comics went out of business in 1956, and sold its properties to DC. It was 1973, tho, before DC made any use of the character, guest-starring him, The Human Bomb, Uncle Sam, and several other Quality characters, in its annual crossover between The Justice League of America and its 1940s counterpart, The Justice Society. Later, those characters were spun off into a new title, Freedom Fighters, which was published from 1976-78. In the '80s, he, like all other DC-owned character who operated during the 1940s, was incorporated into The All Star Squadron. Doll Man is now one of hundreds of minor characters lurking in the background of the DC Universe. He turns up often enough to maintain the company's trademark on him, but it's unlikely he'll ever again be as big a star as he once was. Text ©2001-10 Donald D. Markstein. Art © DC Comics.